In case you somehow missed it, Swansea are out of the FA Cup after losing 2-1 to Leyton Orient. But what happened? I was at the match, throwing my hands into the air as Alan Tate's goal went in. It was an own goal though, and my hand throwing was not in celebration. As has been the case for the last few games, optimism before the match was high, with my own prediction a comfortable 2-0 to the Swans, though many other fans had ideas of 4-0 or 5-0 victories. And why not? Swansea are around 30 or so places above Leyton Orient in the league (if the leagues all rolled into one), so it should be a straightforward victory. How wrong we were again. Though many will argue the team Swansea played was essentially a second string side, it quite clearly wasn't. Williams, Tate, Allen, Moore, Sinclair, Orlandi – these are all first team players! The likes of Alfei, van der Gun and MaKalambay were the only real “second team” players on the pitch, with the rest making several league starts this season. Not reassuring. Leyton Orient weren't that convincing either, and showed why they are a League One side, but they won because they were able to make something out of the few opportunities they had. Still, their counter-attack was slow and their defending allowed Swansea ample opportunity in front of goal. Unfortunately, as has been the running story, they couldn't do much with their time in the box. Swansea have been able to win games in the past, despite not taking all their opportunities, so what went so wrong on Saturday? Orient's first goal was thanks to poor goalkeeping. MaKalambay doesn't ooze confidence, and this game showed why he will always be on the bench while De Vries is still capable. He looked nervous when it came to corners (the first goal proved this) and uncomfortable when dealing with some clearances. In my eyes he was the weakest link yesterday. Generally the rest of the team played fine for the most part, keeping possession and moving the ball well up the field. So if they played well, why did they not win 4-0? Sadly, it's the same old story. They can string together fifty passes, but when it comes to shooting they just don't do it. Kemy Agustien tried to prove me wrong, with a number of shots, but when these are just drilled at the defence, there is little point to them. Luke Moore, again, didn't score, but its no wonder as he just seems so isolated at times. I don't think I clocked that he way playing until about half an hour into the match - very invisible. Teams can play as well as they can, but without a little luck the result won't always favour their performance. It seems luck was not of the side of the Swans on Saturday. Darren Pratley's 'goal' was unlucky not to be given after being deemed offside, though was that bad luck? Did he actually need to be there? The goal may have gone in without his interception, but I guess he wasn't to know that. If that had been a goal, Orient would have been hard pushed to find an equaliser, so it was an unlucky moment in the match, which could have seen the Swans in the next round. On the subject of luck, I will, naturally, have to mention Swansea's gift to Orient of an own-goal hand-delivered by Alan Tate. I've always thought Tate deserves his place in the squad but after yesterday... I still do! You can't really blame him as, though he did ultimately lose the match for the team, it was clearly an unlucky slice that went wrong. He doesn't score own goals that often so we can forgive him. Those who are unable to forgive him need to look at what he has done for the team in the past. So all credit to Leyton Orient who deserved to win, despite being the poorer side. Swansea had their opportunities and didn't take them. Orient will now play Arsenal at home in the next round. Some may think: “bugger, that could've been Arsenal down the Liberty”, although, as many have pointed out, with Swansea's luck they probably would have drawn Crawley Town. Away. So the Swans bow out of the second cup this season. I guess it's good because they can now concentrate on the league? Still, wouldn't it have been nice to see the Swans lift the Championship trophy and the FA Cup? Other teams have done the double before, why not Swansea? I guess we won't find out until next year if this is possible. Swansea winning the Premier League and the FA Cup next season! Now I wonder what the odds of that happening are if the original odds for Swansea to win the FA Cup this year were 150/1! I guess a bit of good luck and it could happen. I hope the videos from my last blog were to everyone's liking, but now it's time to get some of my vague text-based thoughts back out there! As many fans, I wasn't at the Barnsley game on Saturday, though I did listen online where it's sometimes hard to visualise the game. It was easy, though, to understand that Swansea were an immediate mess. I don't know if I am a jinx, but the moment I managed to finally tune into the radio coverage, Barnsley scored. I like to think this is a coincidence, but it's happened too many times for me to let it go unnoticed! Anyway, Barnsley's early goal proved that the confidence of victory before the match was unrealistically high from the fans. Even I, a well known pessimist, predicted a comfortable 2-1 win to the Swans. Some were throwing 3 or 4 nil victories around, but were quickly realising their mistakes. We should all know by now: if Swansea have the chance to go joint top of the table, they won't take it! This match was a good example of the games that they should be winning. Mid-table sides shouldn't really pose much of a threat to the potential champions of the league. Barnsley were 16th in the table where Swansea were just one from the top. Now the Swans have dropped back down to 4th. However I think it's safe to put this down to a one-off bad day. Alarm bells shouldn't be ringing because there's plenty of time to go until the final push, so 4th in the table is not that bad. An inspired Stephen Dobbie was the saviour of Swansea, sparking some much needed creativity in that attacking midfield position, though it was Sinclair who eventually went down in the box and won the penalty. Though it did gloss the overall performance, the goal and the point were deserved of Swansea's last fifteen minute of football. I am speaking like the Swans lost, but it did feel like a bit of a loss, didn't it? As we've seen numerous times before they left it until the last few minutes to turn up the heat, where, had they done this twenty minutes earlier or, dare I say it, from the start of the game, it would have been a certain win. Disappointing, but true. Putting that game aside, I haven't really commented on the Leon Britton situation. He obviously, as he admitted himself, made a mistake leaving the club, but the reasons were understandable (Sousa playing a big part). Britton is a fan favourite and a good midfielder, so the move isn't as odd as it first seemed. He did play on Saturday, but somehow I missed when he was subbed on and didn't hear much about him in the last fifteen minutes. He won't feature against Leyton Orient as he is cup tied, but it would be a good to see more of him against Bristol a few days later. The only other issue to address is the signing of Ryan Harly. Initially I was dubious, thinking the signing of another midfielder was just adding unnecessary wage payouts to the side, but when I realised he was heading back to Exeter until the end of the season it seemed a better plan. Though he doesn't have a great goal scoring record (22 in 118 appearances for Exeter) he is a creative play-maker, something Swansea always need plenty of. If he can create goals for the strikers that's all anyone should care about. I'd rather no midfielder ever score, but consistently set up goals for the strikers. Harley will be a good option if/when players like Pratley and Cotterill leave in the summer. Something different: Swans on film! I'm taking a little break from the ordinary text-based blog to bring you some of the best Swansea City related videos on the net. Most of my weekend was spent drinking wine and sifting through YouTube.com, where I eventually narrowed down my favourites to the five you are about to watch. These are in no particular order (though, in my opinion, I have saved the best for last), so take a break from your day and enjoy! 1) The South Wales derby - "A Tale of Two Cities"
I remembered this as soon as I decided to do a video based blog: the montage that started the BBC's coverage of the South Wales derby last November (you all remember that game surely). Sometimes these promo films can be a little cringe-worthy, but this really captures the rivalry between these two cities. Gives you goosebumps if you are in the right mood! A tribute to the Vetch field couldn't be left out! There were, to my surprise, hundreds of Vetch videos, all with different themes, but I've decided to include this one: the final league game against Shrewsbury town in April 2005. Clear blue sky, everyone singing, football about to kick off - perfect! Not much happens in the video, but should evoke some feelings of nostalgia! 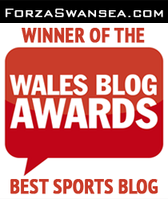 If I didn't include a Lee Trundle video in this blog, I'd be missing out on some entertaining stuff. Swansea's answer to Ronaldo (the Portuguese one, not the fat Brazilian), Trundle's trickery and show-boating made him a fan favourite. Fair enough, Trundle didn't have the greatest final season with the Swans - almost a shadow of his former self - but he will always be remembered for the kind of skill this video collates. This is a selection of moments from Swansea's first season back in the Championship after being promoted from League One in 2008 and contains goals from Ferrie Bodde and Jason Scotland, as well as the Darren Pratley "Swim Away" celebration vs. Cardiff, all set to epic battle music. It's recent history and foundations to where we are now - on the brink of Premier League football once again: the only way is up! I've used this video in a previous blog, but still can't watch it without laughing. Taken during the 8-0 loss to Liverpool in 1990, a Swans fan, "Ciro", jumps over the barrier and proceeds to score a goal (I absolutely love the fans reaction as hammers the ball in). "Ciro" then runs around the pitch, avoiding pouncing stewards, much to the joy of travelling Jacks and Liverpool fans alike! A perfect video to show that, even when the Swans are 8-0 down, Jacks can still have a good time! Naturally there are other videos out there that didn't make the top five, but if you have any suggestions for those that I may have missed, leave links below in the comments box (you no longer have to sign in - anonymous comments welcome) and I'll check them out. If I get enough I'll make another video based blog later in the year! As we all finally emerge from our festive, sherry-soaked hangovers, the transfer window is fully open. Brendan Rodgers now needs to grab what new talent he can, before that window is slammed shut, jamming his little fingers. It's not a new topic: The Swans are struggling with a lack of fire-power, so the main outcome of this transfer window has to be the acquisition of a new striker. Currently Stephen Dobbie seems better suited to the centre forward role as opposed to sole striker as he can create brilliant opportunities, but finds it hard to finish them. Craig Beattie has produced some great goals (vs. Ipswich a few weeks back – I likened it to Fabio Quagliarella's World Cup super chip), but again, isn't the 20-goal-a-season striker Swansea need. Jermaine Easter has finally scored, but doesn't look the complete package. Elsewhere Shefki Kuqi will probably go (a nice guy, as many seem to think, but no longer fits in with the speed of Swansea's game) and Gorka Pintado... well, I was never really a fan, but it seems that he is off to AEK Larnaca on loan anyway, and probably won't return (all the best Gorka, may goals come naturally to you in Cyprus). So a striker is still needed, but who? Luke Moore is in Brendan's cross-hairs with an offer being placed for him to join on loan, but at £20,000 a week will he be able to do the job needed or will he be another “three-goals-a-season” striker? His track record isn't amazing for a front man; he scored a meagre 5 goals in 47 appearances for West Brom (thanks Wikipedia) and, more recently, 4 goals for Derby out of 13 games. If he turns out to be another Frank Nouble (“who?” you cry), which I suspect he might, it will be a backwards step for Rodgers and his men. Meanwhile, other rumours include bringing Marvin Emnes back or trying out Leroy Lita (Middlesbrough), which both seem more feasible than the Sturridge, Vela and Gudjohnsen rumours at the moment. A different option could well be to move Scott Sinclair to the striker position and look at buying / long-loaning a new winger. Sinclair is the current top goalscorer, who can create and (though not recently) finish what he makes. With Sinclair upfront and Dyer on the wing, along with a new, equally speedy winger on the field, the opposition won't know what is coming at them! Just an idea. As I mentioned earlier, Pintado is leaving and Kuqi will probably join him. Ashley Williams is on the radar for a handful of big clubs, but despite his agent insisting he won't leave until the summer (that's only if Swansea don't achieve their promotion target), will Premier League interest in this transfer window prove too tempting? He seems committed enough to Swansea, so he will stay. I am sure. When have I ever been wrong? This Saturday will see the Swans play Colchester at the Liberty Stadium in the third round of the FA Cup. Taking a quick look at the odds (Paddypower.com) Swansea are 150/1 to win! Very generous. Worth a pound? To the betting man (much like myself) I would usually say go for it! I've wasted so much betting on Pintado to score in the past, a pound on Swansea to win the FA Cup at 150/1 is a pound worth gambling. Or is it? Swansea have the power (especially if they get a new striker / winger) to win it. Chances are the "big name" clubs have the Premier League, Champions League and Carling Cup to concentrate on, so they won't field strong teams, giving the Swans prime opportunity to pounce! However, taking a step back, I see that this is probably the case for Swansea too. With such a big prize at stake, chasing promotion to the Premier League is, and rightly so, the priority, so all key players must be kept fit for the next twenty League matches, ready for the final push. The FA Cup is just a series of games where the B-team will get a much needed run around. This isn't to say that the Swans won't get far. Despite putting out a weakened team on Saturday (its bound to happen), they should still beat Colchester with ease (3-0 to the Swans is 10/1, which IS worth a pound). Where next? Well it'll be round four and, if they draw another lower league or Championship team, there's nothing to say they can't proceed a further round. If, however, they find themselves up against a Premier League side - no matter if it's Wolves or Man United - Rodgers will probably field another weakened side and flop out. Disappointing? Slightly. It would be great to see the Swans perform well and go as far as they are actually capable of (beating Wigan could have happened back in October if they were at full strength). Now the “supporters” who will probably boo the Swans off the park if they get knocked out of the FA Cup so early on have the argument that “we wanted to see a big name team down the Liberty for a change!” Although this may be true, if they glance ahead to next season, Swansea will be constantly playing the big name teams when they get to the Premier League. This is why the FA Cup isn't important this season. This is why patience, as Brendan Rodgers has called for many times, is so necessary. I'm saving my pound.